Outside this window, blackberry bushes are huddling together, their white flowers rustling in the breeze. Overhead, a thin layer of grey clouds, the same ones that have been hovering over our heads all of June. (My brother said it the other day: it’s like walking under Tupperware all the time.) The garden, finally planted, is still a clutch of hopeful little plants, somehow striving toward full height before the fall. I know that it’s summer with you too. Too much summer for many of you. A friend in Maryland told me yesterday that it was 85° in her house at 10:30 pm, with the power company saying they’ll have power restored by Friday. A friend in Kansas posted on Facebook today that “We are rapidly moving from ‘fry an egg on the sidewalk’ heat to ‘open a sidewalk omelet station’ heat.” In a few days, we’re heading to Tucson to spend a few days with Danny’s parents. Seeing them? Oh yes. 106° heat? Well, I’m not sure how I’m going to explain to Lucy that she really can’t go outside. So I’ll take these Tupperware conditions and the faint breeze that is blowing on my arms as I write this. Summer flashes so many images through my head. My pointed feet sliding into chlorinated blue water, silently. Egg salad sandwiches in an air-conditioned house after swimming outside, a glass of cold lemonade beside. The smell of baby oil on my skin growing warmer, as we sat on the hot sand at Newport Beach, trying to tan. The cool of my room in the hot afternoon, the musty smell of library books permeating my nose as I turned the pages. Danny and I have been talking about what summer feels like for Lu, what images she might remember later. Hers will probably be of blackberry stains on her arms and lips, the way her tiny blow-up pool bends under her body as she jumps in with both feet, the frustrating feeling of being told to go to sleep when light seeps in around the edges of her blackout curtains. Of course, years from now, she may not remember one thing from this summer. That’s one of the biggest acts of love: to parent, knowing the kid won’t remember the thousand little chosen moments. I sometimes wish that I were the kind of organized summer parent my friend Molly is. She has lists of activities planned for her kids, all summer long: identifying beetles, a butterfly study, creating comic books, gardening, making movies, board games, and paper mâché. People, I have always been a failure at paper mâché. I always ended up with glue splattering my arms and a sadly withered little figure, intended to be something but mostly just a flop. Kid crafts intimidate me. We do science experiments around here  baking soda and vinegar explosions!  and play t-ball, water the garden, play dress up, cook together, watch Lu put on puppet shows, and read piles and piles of books every day. (I started reading Charlotte’s Web to Lucy last night and had a hard time not tearing up.) But planned crafts and scheduled activities? I kind of stink at that. And suddenly, I remembered that the best feeling of summer was the hours in the backyard, building replicas of Knott’s Berry Farm in the mud or throwing a tennis ball up against the nubbly wall of our home, pretending that I was the first baseman for the Dodgers. I can still see my brother sitting at the old wooden desk in my parents’ bedroom, tapping out letters on the electric typewriter, the sun lighting up his blond hair into a glowing halo. This is what I want to give Lucy in summer (and the rest of the year). The feeling that our lives are only loosely planned. We live within a structure that bends to our touch instead of resisting stiff against our hands. Let there be a few hours on a Sunday morning with absolutely nothing ahead of us. That way, Danny and Lu can bring chairs onto the grass, find the blue blanket with green circles and drape it over them to make a fort. They can huddle under the blanket, Danny telling Lu what camping is like, and how rain sounds on a tent at night. From that springs the idea, fully formed: let’s take her camping on the Oregon coast this summer. From idleness, the best ideas. And salads. Summer, to us, means salads. Beet greens, fennel tops, chard leaves, nasturtium flowers, and bits of kale. All topped with goat cheese made by the woman on the island with enough goats to create a goat cheese CSA. Sunflower seeds. And a new favorite dressing. Maybe that is what this summer will taste like. Time will tell. I just know I want to enjoy it all, relaxed and planning as little as possible. 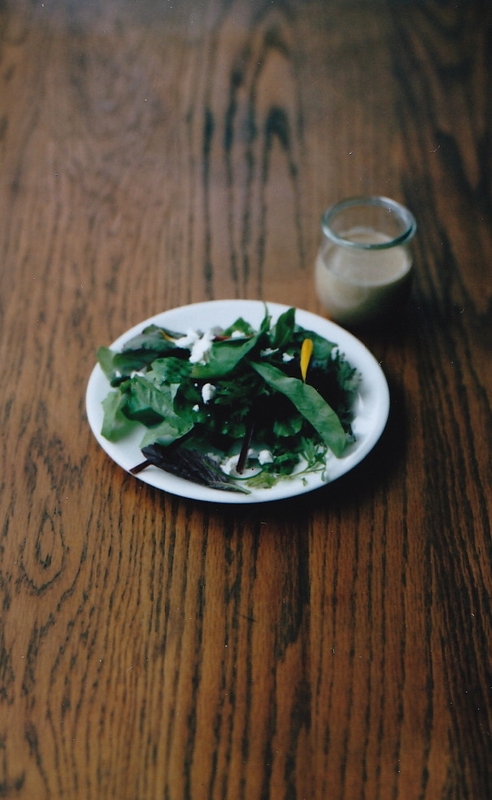 My friend Sara Kate wrote wonderfully last week about a salad dressing she has been loving. “…there’s a five-year-old at my hip who declared it ‘the dressing that makes me into a lover of salad things’ or perhaps it is because that five-year-old’s babysitter asked to be paid in jars of dressing rather than real money.” Sign me up. Everyone in our family is already a lover of salad things. I went to the store to buy tahini and miso to make it. Luckily, we’re intrepid around here. Danny and I talked about the taste of miso paste, what it might add to this dressing, and we figured out a substitute. Fish sauce and tamari both have the salty umami quality of miso. (You have to be careful about fish sauces too. Our favorite gluten-free brand is Red Boat.) With all that salty and a bit of bitterness, we added some maple syrup to mellow out the dressing. Since making it yesterday, we’ve had three salads each with this on it. I’m pretty sure it would make a great dip for fresh snow peas, a lovely sauce for brown rice, and when it thickens, a spread on gluten-free bread. Here, we’re sticking with the salad for now. Pour the tahini into a jar. Add the brown rice vinegar, maple syrup, tamari, fish sauce, and pepper. Whisk it all together well into a smooth paste (if you can’t fit a whisk into the jar you have a chosen, a fork will do). Taste the dressing. Add more of whatever you feel it might need. Pour in the hot water and stir like mad until it has emulsified and looks like the dressing above. Let the jar sit for an hour, to give the flavors a chance to mingle, before you use it. It stores in the refrigerator for up to a week, thickening every day, so don’t be surprised if you have to add a bit more hot water and stir on some days. Makes about 6 ounces (enough to make 6 to 8 salads). I was lucky to grow up in the Pacific Northwest … and one of my favorite summertime memories is swimming in the creek with my cousins, amongst the blackberry bushes and with the frogs. Those afternoons would inevitably end with blackberries in my hair (I was the only girl, constantly surrounded by boys) and a smile on my face. Thank you for reminding me of my own loosey-goosey, unstructured childhood. I wouldn’t have traded it for anything. Thanks for the recommendation. My husband has celiac and probably my daughter as well… I’ve recently started using lots of miso and have been using this one http://www.great-eastern-sun.com/stuff/miso-master-organic-kosher-mellow-white-miso-#more_info because it says “rice koji” but if the “koji spores” could be from barley…. How do I find that out???? Please help? I don’t want to jeopardize my husband’s health. Sarah, give the company a call. I buy an organic miso paste that uses brown rice instead of barley; I use it in a dressing very similar to this one and it’s basically my favourite dressing ever. I’ve also bought chickpea miso that is entirely grain-free! I’m jealous of your summer! Ours here in east TN is just insanely hot. Can not enjoy it at all. And blackberries here are already a memory. Last week due to heat and dryness, they just gave up the ghost. Nothing left but dried up, blackened kernels. I love tahini dressings. My favorite is a tahini based goddess dressing, but I’ll have to try this one too. As far as heat goes in Arizona, I spent a week or two in Phoenix most summers as a kid. I’ve always found that 105+ degrees of dry heat is vastly better than 85 degrees of humid heat. One of my favorite memories from those summers is going to a water park with my cousins. We had a grand time dancing across the pavement from the pool to a ride and skittering back again. Hats and sunscreen were required but worth it. Admittedly most of the outdoor time was in the mornings and evenings, but midday walks to the store were never out of the question. I’ve met a lot of people who prefer hotter dry heat to humid heat. I’ve also met some people who strenuously disagree. It seems to be a matter of childhood environment and physiology. But do give it a chance. See how you and your daughter feel. Our local Co-op and the Whole Foods store here in Santa Fe NM carry a fantastic brand of packaged-in-glass miso made in MA: South River Miso (www.southrivermiso.com). More flavors than you can imagine. Their website lists the ingredients for each type of miso; the 3 that I looked at all stated no gluten. Maybe your local store can order from a distributor that carries their line? It’s well worth searching for. Please tell Danny that I’m the one who recognized him at the Tesuque Flea Market during your visit here. So glad you had some memorable food in Santa Fe. Thank you, Carol! We’ll try it. Also, you made Danny’s month when you recognized him at the flea market! We love Santa Fe. I’ve been looking for a good summer dressing, and this one sounds like I’d like it. One of my favorite childhood memories is playing with Matchbox cars in the shade of a big tree in our backyard. We created roads, made buildings, and pretended we were the drivers of our cars, which just did fairly ordinary things, like race between the post office and the grocery store. Wow, that was lots of years ago!! Not red miso, but I’ve had this brown rice one without any problems. As far as I know Koji is grown on rice. That being said, I’m not super senstitive to trace gluten so best to research first! I’ve also used another Brown Rice Miso by a company called – I think – Mitoku, and seem to remember that their koji is rice based too. Thank you for the recipe! I am blessed to live on the OR coast. I can tell you in Rockaway beach there is a great little camping and RV spot right on the beach called Shorewood. There is a delightful pizza place about 1 mile from there that makes everything from scratch including a gluten free pizza. We give our kids these opportunities (travel, crafts, idleness, reading and the like) because it allows them to become different people -whether they remember or not- than kids who don’t get to do these things! And because it is fun for us, too! Lovely post – I’ll have to try the dressing – sounds perfect for summer. As far as summer crafts go – tie dye shirts! I hadn’t done it since I was a younger girl (20 or 25 years ago) with my grandmother. I just did it with my two little ones (10 and 2 and a half). IT WAS SO MUCH FUN! Super easy and the shirts turned out awesome (I used the Jacquard tie dye kit – great results, instructional DVD makes it easy, and really colorfast dyes. I bought two kits so I could mix colors – it comes with red, yellow and blue but if you buy two kits you can make green, purple, and orange – or whatever else you want to make – and then you can dye lots of things). My little girl (the two year old) loves her “color” shirts and asks for them all the time – telling everyone “I made it!” We had so much fun we ended up dyeing 20 shirts in total – we have our “summer uniforms” this year, I guess! like free flowing days too, having ideas are good but do not always work out- more of a back up. Talk of science experiments oh man wait until you hear the one my Grandkids came up with the other day. I had told them to be careful I had a storm window lying out in the yard, we had moved it temporarily….so a couple days later my sister found it broken. I have some Miso I think is gluten free I got on the internet but will double check for sure, it is home and Im not right now. I actually printed this recipe from The Kitchn last week. Sara Kate made it sound so good. Glad to know there’s an alternative. Wonderful recipe! I’m looking forward to trying it! I use a brand of miso called Miso Master Organic, which I use for dressings. I get it at my local Whole Foods. They have both rice based misos and barley based ones – which are processed separately. Their brown rice miso is amazing and is the one I typically use in my salad dressing. So simple and yet so yummy. Its simple things like this that make food so enjoyable. Ah, Shauna, you made me snort my coffee! Mostly because I had (have) to be dragged into crafts by my little makers, despite the mess and my misgivings. (Three will do that to you. We adapt.) It took me all of four hours from seeing this post to making this dressing: MAGIC. We’ve eaten it three times, already. So thank you, for that. It will be our summer dressing, as well. Drink up everything Arizona has on offer. I am all for holy high messes, my dear. And SO glad you’ve made the dressing. That makes my day better. We like the Eden Foods brand miso that they sell at our local health food store. I’m sure you could find it at Whole Foods or even online. We sure are spoiled here on the West Coast! We’re in Berkeley and I don’t think it got to 70 today. The family in Texas wants us to visit but it was 107 there over the weekend. My kids would melt! I’m a great believer in children ‘bumbling’ around outside exploring. I remember the first time my 4 yr old came in and told me ‘I think I’m bored mummy’ my response was ‘that’s a shame, because bored people have to go to bed’ We never had that problem again… And that was 10 years ago! that’s a great idea. I’ll have to tell my grown kids when they have ones of their owns. One funny one I did like that was if they kept bugging me for something –When can I have this, when can we do that….etc. I would just make them wait longer. That took care of that. They soon learned not to whine and keep asking. Holy Fabulous Dressing! We got three heads of lettuce in our CSA this week, and I’ve got a few growing (read: bolting) in the garden. I made this dressing, and can’t get enough! I’ve been feeding the bottle with more ingredients as we go through it. I use a little more lemon juice then they call for, and add zaatar as well. My summers were made up of a hot & steamy overnight camp, with swimming at the lake twice a day, sing alongs, campfires, etc. Immediately upon picking us up from the camp bus 3 weeks later, my parents would drop us off at the pool and take our clothes to the laundry-mat (a system that went into place after spiders ran out of the duffel bag in the basement following year 1). Dropped off at the pool at 9am, picked up in the evening for most of the rest of the summer! A friend of mine just posted pics on FB of her kids playing with various colored blocks of ice that she froze in various containers. They sat on a plastic tablecloth. She said they played for hours. Well hope this gives you some ideas. Happy summer you and your family!! 🙂 Stay cool!!!! Quite possibly the best dressing I have ever had. Oh yeah! I have to say, we just keep making more and more.